I was asked a few days ago, why is Downton Abbey called an abbey when it’s just an awfully big house? It is of course a fictional name for the great house in the beloved show, Downton Abbey. But there are many old country houses called xxxxxAbbey. This Abbey naming of houses occurred in 1538 due to the Dissolution of the Monasteries Act. Shortly after the lands and buildings were sold to the wealthy. Many of the wealthy had their own little houses of prayer, and I imagine the naming of these houses was a tribute to their belief in God. Most houses that have the name Abbey attached to it, were either once abbey’s, or were built on the site of abbeys, demolished or no longer in use. 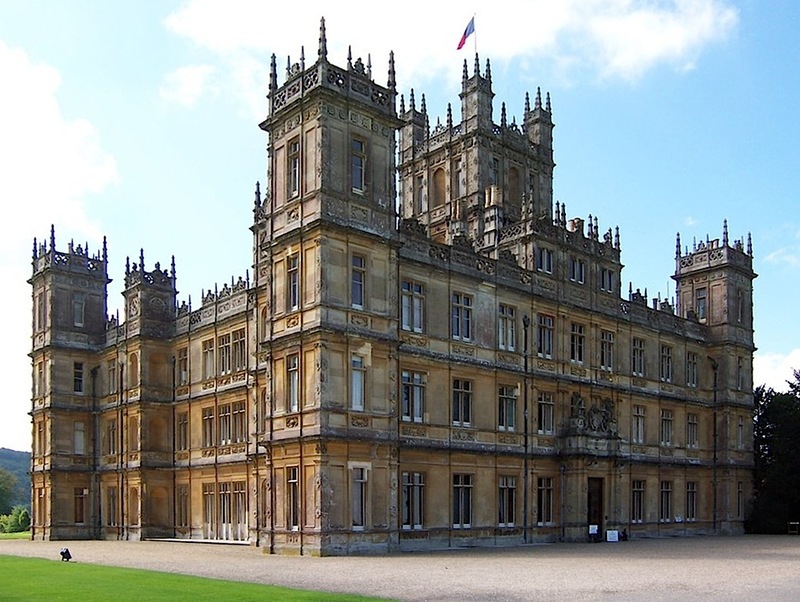 Downton Abbey is actually Highclere Castle in Hampshire. It’s on the site of a former ecclesiastical property and was used by the bishops of Winchester in the 12th century. It does have a Monk’s Garden. Westminster Abbey is another example of an Abbey that is no longer an abbey, as there are no monks living about the place, praying. Did I sound like the Dowager Countess? What an ugly moniker. Dowager, there is a Dowager hump which sounds awful. The word is just the title for a widow who now owns the property and behaves with the utmost dignity. In this case we have the beloved Maggie Smith portraying the Dowager Countess of Grantham. Perfection in casting! I adore Maggie Smith, and I am throughly enjoying this series. One of my favourite bits of the show, is the introduction, the slow shot of Lord Grantham and his golden lab walking up towards Downton Abbey. Apparently Pharaoh, played by Roly, had to be replaced as he did not get on with the dogs at Highclere during filming. Just what he did he get up to? Gallery | This entry was posted in England and tagged Abbey, Dowager, Dowager Countess, Downton Abbey, Grantham, Hampshire, ITV, Lady Grantham, Maggie Smith, Pharaoh Downton Abbey, Tales from the City by Susan Sheldon Nolen, Westminster Abbey. Bookmark the permalink.